First patented 40 years ago, prefilled syringes have experienced tremendous growth alongside the increased development of large molecule drugs. The injectable drug delivery market is second in size only to that of oral medication, and prefilled syringes constitute one of the fastest growing segments of that market.1 As opposed to their glass vial counterparts, prefilled syringes provide a cost-effective and user-friendly delivery system for a controlled dose of a biologic or drug product. With products that are intended for use in ophthalmic applications or administered in the sterile field of the operating room, it is often necessary to perform a sterilization or decontamination operation on the exterior surfaces of the syringe while in a sterile barrier package. 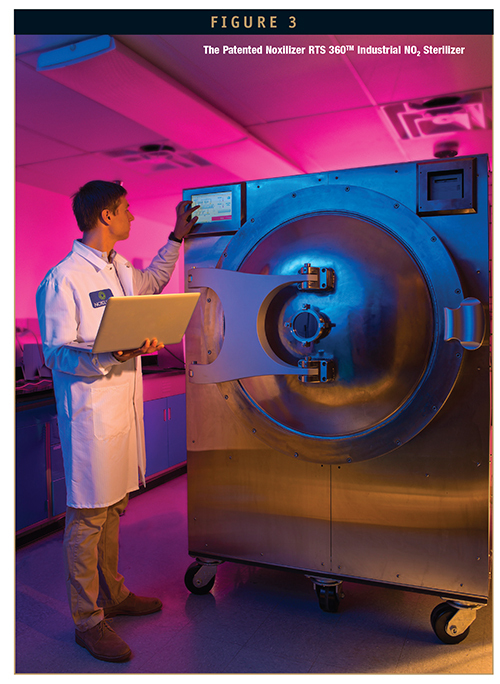 With temperature-sensitive drugs or biologics, this can present challenges for manufacturers. Today, the most commonly employed methods for sterilization are: steam, ethylene oxide (EO), and gamma radiation. These methods have served the market well for many years, but as drugs and delivery devices have advanced, some limitations have become apparent. Sterilization with traditional methods often requires exposure to elevated temperatures or damaging radiation, which may lead to degradation of the drug product or container closure materials. Additional concerns include leaching of sterilant residuals from the stopper, the duration of the process, and the costs of sterilization. Nitrogen dioxide (NO2) is a well-documented and researched gas. Sterilization with NO2 gas can provide a solution to some of the limitations presented by existing options. It can also provide the process flexibility to manufacturers that will support continued innovation and growth in the prefilled syringe market. Noxilizer, Inc. designed the Noxilizer RTS 360TM Industrial NO2 Sterilizer that provides surface sterilization of prefilled syringes with a range of material compatibility and low levels of residuals using its rapid, room-temperature process. Sterilization of prefilled syringes today is predominantly accomplished using steam, EO, or gamma radiation. While these methods are well established, their limitations could impede innovation and progress in the pharmaceutical and biotechnology industries. 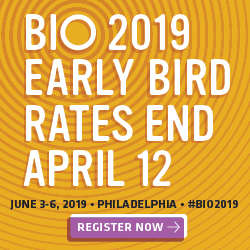 More than 60% of new drug products being developed today are biologics, such as protein therapies.1 This rapid rise in biological drug development is expanding the market for new sterilization technologies that can overcome the limitations of current methods. No single sterilization method will be compatible with every product on the market. Steam sterilization has been around for more than a century and is well understood in both industrial and hospital settings. EO has a long track record with the broadest material compatibility, and gamma radiation offers a low-temperature option. Each of these methods has specific weaknesses with respect to sterilization of prefilled syringes. These weaknesses, discussed further, were the driving force behind the development of NO2 sterilization. At present, steam sterilization is the primary method employed for sterilization of glass prefilled syringes containing heat-stable products, such as saline. However, because it involves both very high temperature, typically 121°C, and pressure, it is not well suited to sensitive biologics and drugs. Further, more and more companies are looking to alternative plastic materials, like cyclic olefin copolymers (COCs), and fluoropolymer coatings to minimize any leaching or particulate interaction with the solubilized drug and patient.2 Most of these new plastic materials cannot be exposed to high temperatures without experiencing degradation. EO sterilization presents an alternative to steam sterilization for the external surfaces of prefilled syringes. However, EO also presents its own challenges. Although EO does not use the high temperatures of steam sterilization, it still requires temperatures in the range of 40°C to 60°C, and a relatively deep vacuum in order to achieve sterility. This can have an adverse effect on temperature-labile products, and the vacuum can cause unacceptable stopper movement due to pressure changes. Drug manufacturers and researchers have long expressed concerns over the carcinogenic nature of residuals from the EO sterilization process.3 The EO process can require lengthy aeration phases (9 to 17 days), often at elevated temperatures, to remove residuals from plastic syringes.4 The lengthy aerations may compromise drug integrity or manufacturing efficiency. Another issue with EO is sterilant ingress, the diffusion of the sterilant past the container closure system into the product itself, which can lead to unacceptable levels of residuals within the drug product causing modifications to chemical structure and product activity. EO sterilization also presents significant manufacturing and operator concerns. The cycle requires preconditioning and post-cycle aerations, which can lengthen the turnaround time considerably. Adding to this is the drawback of having the EO process performed offsite, turnaround time can extend to 7 to 25 days, depending on the product. The EO process also involves health and safety concerns, with operators at risk of exposure to highly flammable, carcinogenic, and cytotoxic chemicals and residuals during routine operation and disposal.5 Refer to Table 1 for a comparison of the safety-related properties of EO and NO2. 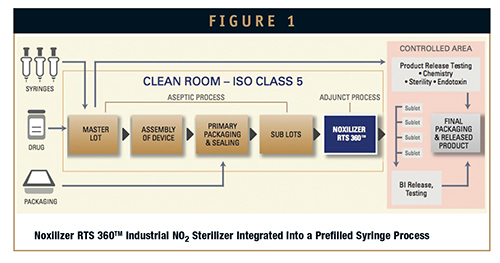 Unique sterilization methods, such as Noxilizer’s NO2 sterilization process, offer a much-welcomed alternative to companies working to sterilize drugs delivered via prefilled syringes or delivery systems. Noxilizer’s advanced room-temperature sterilization process uses NO2, a well-researched gas, in combination with humidity to inactivate resistant microorganisms and deliver sterile product. The FDA recommends adding an adjunct process, or additional sterilization step, to “increase the level of sterility confidence” when aseptic processing is used in drug manufacturing.9 This is especially true for products that are intended for use in ophthalmic applications or in the sterile field of the operating room. NO2 gas is a surface sterilant that does not penetrate the container closure system and results in low surface residuals. The capability to sterilize at room temperature is fundamentally important because the rate of chemical reactions is approximately doubled for every 10°C rise in temperature. Maintaining lower temperatures ensures that any reactions that might occur with the product, such as denaturation and agglomeration, are minimized. NO2 is a non-condensing gas, and as such, it can be an excellent sterilization choice for lumens, needles, and other challenging geometries in comparison to condensing vapor systems.10 Coupled with the ability to sterilize with low humidity and temperature, this gives NO2 a distinct advantage when considering sterilization of combination medical devices and surface sterilization of the final product. Noxilizer’s NO2 technology is especially well suited to, and can be conveniently installed as, an adjunct process for products that require surface sterilization (Figure 1). By providing solutions to the challenges presented by steam, EO, and gamma sterilization, NO2 can help broaden the horizon for use of all types of prefilled syringes, including dual-chamber and combination devices, as the drug delivery system of the future. NO2 works as an oxidizer that inactivates microorganisms through degradation of DNA, providing a sterility assurance level (SAL) of 10-6 at relatively low gas concentrations. Biological indicators for the NO2 sterilization process consist of spores of Geobacillus stearothermophilus, which is the same organism used for steam sterilization. A recent study, performed in the Noxilizer lab, demonstrated a 6-log reduction in the population of biological indicators placed next to the plunger rod in the barrels of water-filled COC syringes. 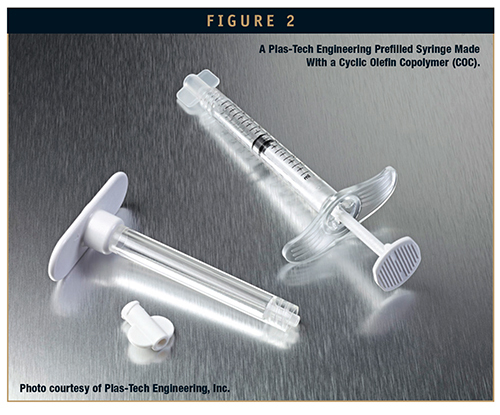 The syringes, along with thermoplastic elastomer tip caps and stoppers, were provided by Plas-Tech Engineering, Inc. of Lake Geneva, WI (Figure 2). For the study, they were packaged in Tyvek-Mylar pouches. The exposure used in the study employed minimal vacuum (less than 1 psig) to deliver 10 mg/L NO2 and 75% RH for a dwell time of 45 minutes. Including a 30-minute aeration phase, the total cycle time was 90 minutes. Noxilizer’s demonstrated ability to sterilize the exterior surfaces of polymeric prefilled syringes using a rapid cycle, minimal vacuum, and a truly room temperature process suggests that NO2 sterilization is an ideal solution for manufacturers of sensitive biopharmaceuticals. 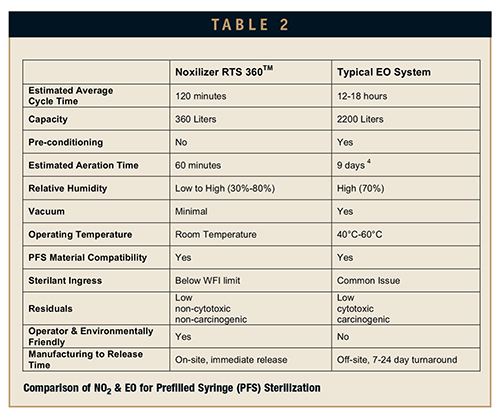 Table 2 provides a comparison of NO2 sterilization with EO. In addition to the advantages outlined in Tables 1 and 2, the financial benefit of using NO2 instead of EO could also be substantial (up to 40% to 60% cost savings). NO2 sterilization equipment is significantly less expensive and does not require extensive facility modifications to be installed. This would allow manufacturers currently using contract sterilization to move their sterilization process in-house, thereby reducing costs and turnaround times. NO2 gas offers a faster and more compatible option to companies looking to manufacture their products in prefilled syringes. The RTS 360TM can be easily installed in any manufacturing setting with a 240-VAC, single-phase connection. No other facility modifications or specialized equipment, such as an EO abator, are required. After exposure, the exhaust gases from the NO2 sterilization process are passed through an on-board scrubber, which neutralizes the sterilant, rendering the exhaust safe for the operator and the environment. The spent scrubber material is a solid, landfill-safe material. 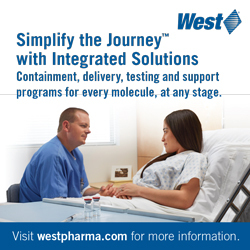 This makes bringing sterilization in-house easy and safe, resulting in faster turnaround times. For those manufacturers who would prefer to have sterilization done off-site, Noxilizer offers contract sterilization services in ISO 13485-certified facilities. Noxilizer’s microbiology and materials science expertise is available to develop and validate processes specific to a customer’s product needs. While NO2 gas provides an excellent option for surface sterilization of the final prefilled syringe product, there are also clear benefits to integrating NO2 sterilization into other steps of the prefilled syringe manufacturing process. With the same NO2 technology, Noxilizer has developed the NOX FLEXTM Rapid Biodecontamination System, which provides significant gains in cycle times versus current technologies. Noxilizer has also designed an in-line sterilization system that will allow manufacturers of syringe components to efficiently sterilize product without having to send truckloads of syringe tubs to EO contract sterilization facilities. A similar system can also be used to decontaminate the exterior surfaces of the syringe tubs prior to entering a filling isolator without the concern of shadowing that arises with e-beam. In a related area, Noxilizer has already completed a global supply agreement with Weiler Engineering, Inc. for an NO2 decontamination system for their Blow-Fill-Seal aseptic filling equipment. 1. SPECIAL FEATURE – Prefilled syringes & parenteral contract manufacturing – product differentiation is critical. Drug Development & Delivery, May 2014. http://www.drugdev.com/Main/Back-Issues/695.aspx#sthash.bBo1ngC9.dpuf. Accessed July 22, 2014. 2. Petersen C. Trends in pharmaceutical primary packaging for injectables – solutions for new challenges. Drug2012. 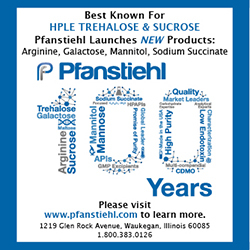 http://www.drugdev.com/Main/Back-Issues/199.aspx#sthash.hM4LE807.dpuf. Accessed July 24, 2014. 3. Patel K, et al. Effect of dry heat, ethylene oxide and gamma radiation on gelatin and gelatin capsules. Indian J Pharm. Sci. 1979;Sept-Oct:209-213. 4. Chien YC, Su PC, Lee LH, Chen CY. Emission characteristics of plastic syringes sterilized with ethylene oxide–a controlled study. J Biomed Mater Res Part B Appl Biomater. 2009;91(2):579-86. Doi: 10.1002/jbm.b.31432. 5. Note for Guidance on Limitations to the Use of Ethylene Oxide in the Manufacture of Medicinal Products. The European Agency for the Evaluation of Medicinal Products – Evaluation of Medicines for Human Use. Committee for Proprietary Medicinal Products. London, March 2001. http://www.ema.europa.eu/docs/en_GB/document_library/Scientific_guideline/2009/09/WC500002915.pdf. Accessed August 13, 2014. 6. Reid B. Gamma processing technology: an alternative technology for terminal sterilization of parenterals. http://www.gammapak.com/images/reid.pdf. Accessed August 3, 2014. 7. Hasanain F, Guenther K, Mullett WM, Craven E. Gamma sterilization of pharmaceuticals–a review of the irradiation of excipients, active pharmaceutical ingredients, and final drug product formulations. PDA J Pharm Sci Technol. 2014;68(2):113-37. Doi: 10.5731/pdajpst.2014.00955. 8. Silindir M, Ozer Y. The effect of radiation on a variety of pharmaceuticals and materials containing polymers. PDA J Pharm Sci Technol. 2012;66(2):184-99. doi: 10.5731/pdajpst.2012.00774. 9. Guidance for Industry – Sterile Drug Products Produced by Aseptic Processing – Current Good Manufacturing Practice – Draft Guidance. U.S. Dept. of Health and Human Services – Food and Drug Administration – CDER – CBER – ORA. August 2003. \CDS029REGAFF!guidanc1874dft.doc. 10. Summary of Lumen Sterilization Testing: Comparison of the Noxilizer and STERRAD Cycles. August 2012. http://www.noxilizer.com/pdf/news/WhitePaper-NO2-vs-H2O2-Lumen-Testing-Summary_8-12a.pdf. Accessed August 13, 2014. 11. Goulet E, Mullins S, Levine R, Cooper J. Depyrogenation and sterilization of medical device materials with nitrogen dioxide gas. Scientific Poster, October 2013. http://www.noxilizer.com/pdf/publications/scientific_poster_no2_sterilization_and_endotoxin_eduction_oct_2013.pdf. Published October 2013. Accessed July 23, 2014. 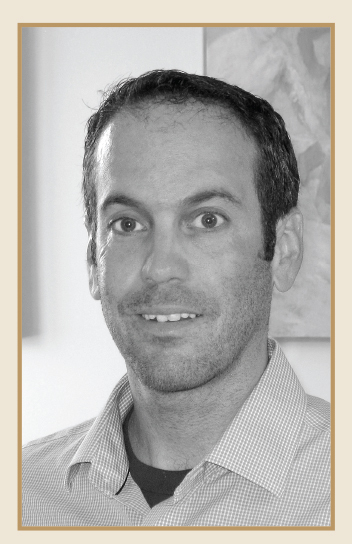 Dr. Evan Goulet is Director, Sterilization Operations at Noxilizer, Inc. In this capacity, he works with customers to develop NO2 sterilization process validation plans for medical and drug delivery devices. Dr. Goulet earned his Bachelor of Materials Engineering from Auburn University and his PhD in Materials Science from the University of Pennsylvania. He can be contacted at egoulet@noxilizer.com. Elizabeth Robbins, since joining Noxilizer Inc. in 2009 as a Senior Microbiologist, has expanded her microbiology expertise through development and testing of their novel sterilization process. 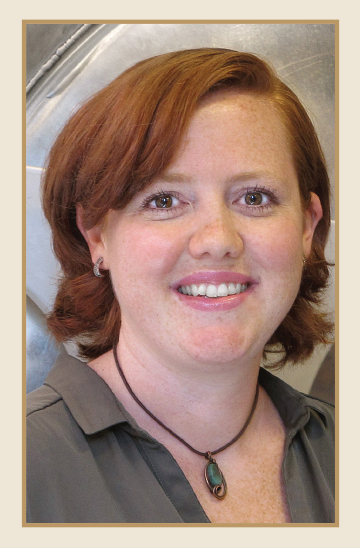 Ms. Robbins earned her BS in Biotechnology in 2006 from Stevenson University in Baltimore, MD. She can be reached at lrobbins@noxilizer.com.